Developed from a private venture prototype of 1927, the Bulldog entered squadron service initially as the Mark II in May 1929. Its superb aerobatic qualities, strength of construction and, for its day, excellent performance envelope endeared it to most pilots, and the Bulldog eventually equipped a total of 10 RAF fighter squadrons. 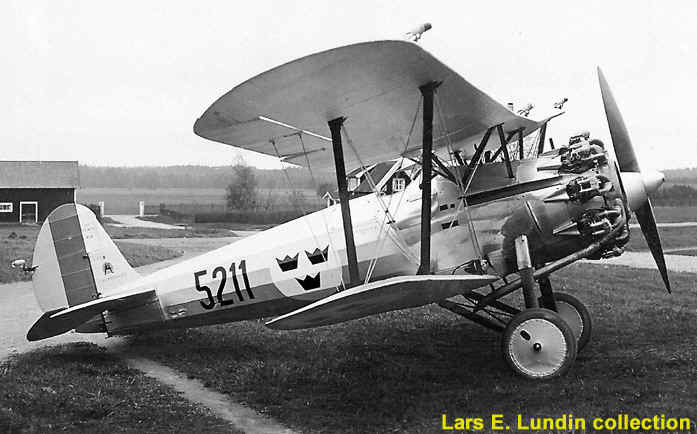 At least 87 two seat trainer versions were later produced and the last 17 Bulldogs built were sold to Finland in 1934. These aircraft later saw active service in the 1939-40 Winter War against the USSR. Bristol Bulldogs finally left RAF service in 1937. The R.A.F. 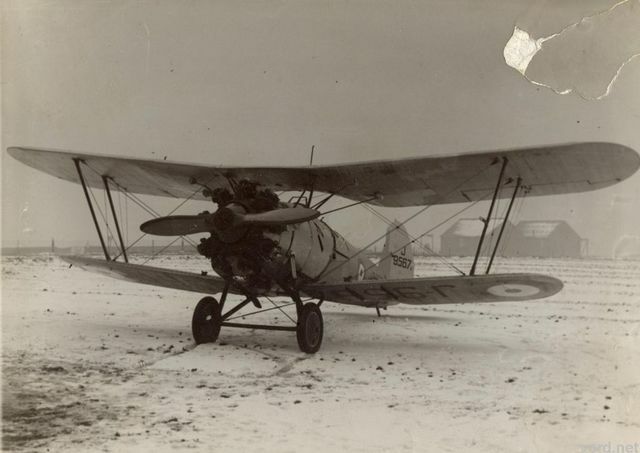 BE2b was the principal two-seat reconnaissance plane of the Royal Flying Corps, and its specifications seemed sufficient for the military authorities in the early part of WWI. However, the obsolescence of its design and the appearance of new machines in the adversary's air fleet made its replacement urgent. The unfavourable military situation, in which Britain had lost its initiative in the skies of the Western Front, forced the military command to look for support among private firms. 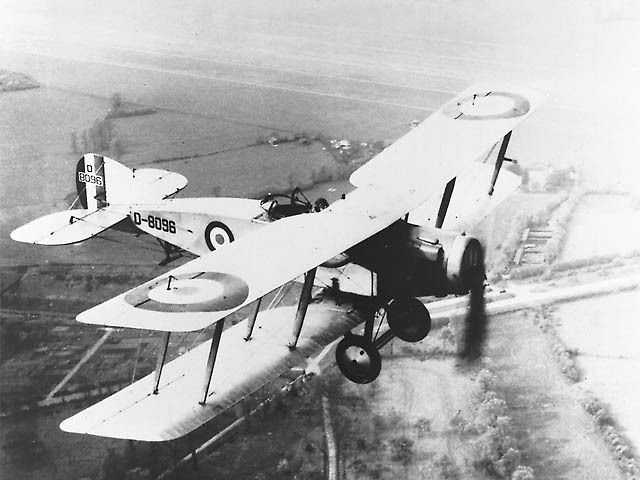 One of them, the Bristol Aeroplane Company, had a project for the construction of a two-seat general-purpose aircraft, which could be, used both ways: as a reconnaissance plane, and also in the tight manoeuvres of air battles. The prototype F2A with a Rolls-Royce Falcon engine made its first flight in September 1916. 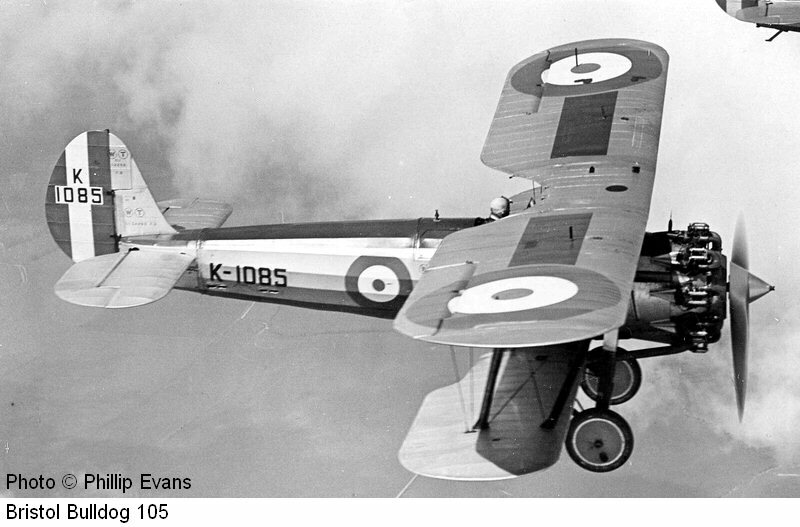 By the end of the same year, 50 planes were transferred to 48 Squadron of the Royal Flying Corps. To start with, the F2A was used as a regular two-seat fighter plane and this led to fatal consequences: during the first operational flight four planes out of six were lost. In spite of this initial failure, the Bristol Company obtained a new order - this time for 200 machines. After some minor design changes, the F2B appeared, receiving a simple name: "Fighter". 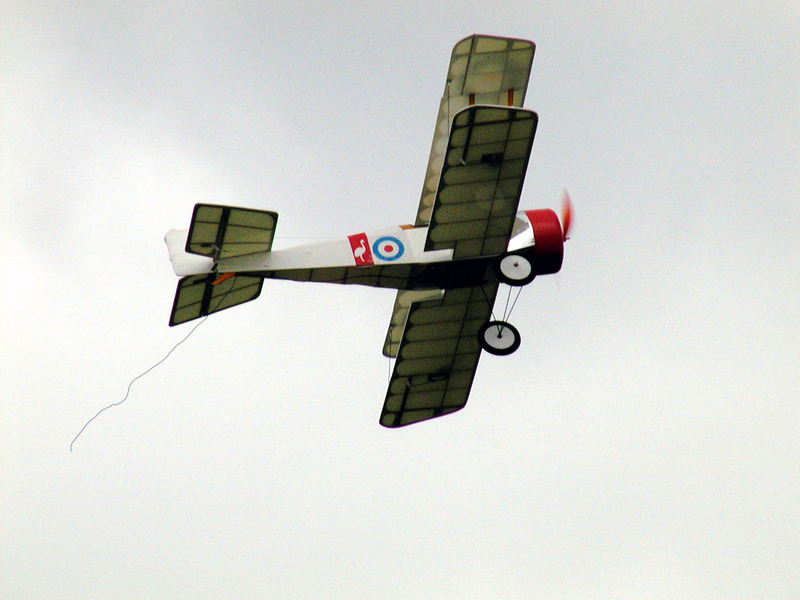 Along with the appearance of the F2B, the use of the plane changed - now it was flown according to the tactics developed for single-seat planes. However, the strength of its construction and its ability to defend the rear hemisphere were indisputable advantages of the design. 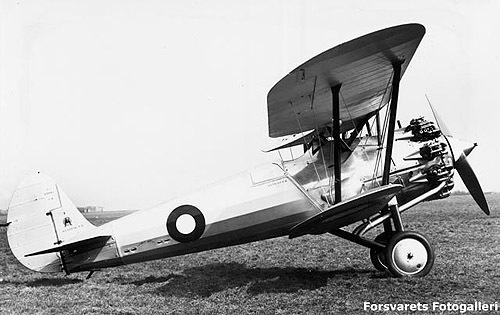 The F2B quickly became popular among its pilots who nicknamed this plane 'Brisfit'. The quantity of new machines was growing rapidly - soon these planes were delivered not only to Front Line units, but also to Home Defence. However, numerous problems with the engine seriously held back attempts to increase production of the type. The Bristol Company was forced to look for a substitute for the Falcon. Attempts to fit Hispano Suiza, Puma and Sunbeam Arab engines all failed (only the last one of them was built as a series modification). For this reason most F2B Fighters had a Rolls-Royce Falcon engine. 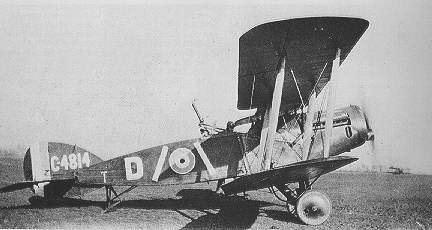 Apart from on the Western Front, the Bristol Fighter was widely used in other theatres of war; in Italy and Palestine. Aircraft serving with Home Defence managed to shoot down at least two German Gotha G.V strategic bombers. The most successful pilot to fly the Bristol F2B Fighter was the Canadian Andrew Edward McKeever - all of his 30 victories were won solely with this type. Another famous Canadian ace William Barker also flew the F2B. 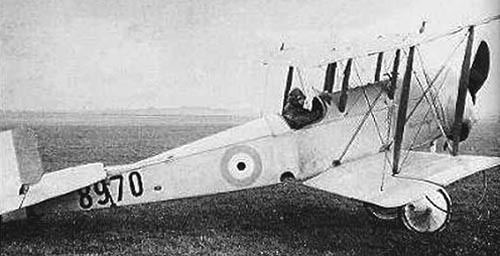 By the end of WWI the Bristol Company had received orders for 5,500 of these planes, 3,101 of which were transferred to combat units. After the Armistice, the additional contracts were cancelled. Altogether, taking into account later modifications and experimental examples, the total of machines built reached 4,747. Apart from Great Britain, the Bristol F2B Fighter was used by the Air Forces of several other countries - Ireland, Poland, Belgium, Spain and Greece. Such British dominions as Canada, Australia, New Zealand and the South African Union used the Bristol F2B Fighter in their air fleets. Some of these planes remained in service until 1939. 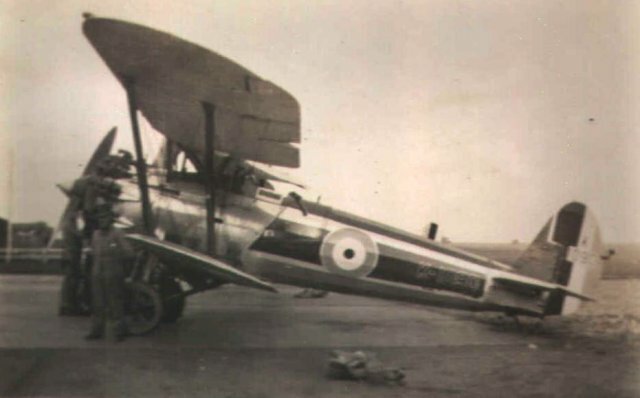 Thus, the Bristol F2B Fighter, designed during WWI, faced another major world conflict, but this was a time for aircraft belonging to a new generation. Built as part of an order for 300 aircraft and fitted with a Rolls-Royce Falcon engine. 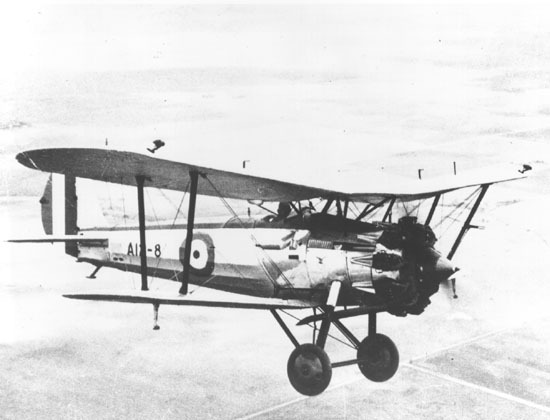 Built by Marshall and Sons as part of an order for 150 aircraft although only 83 confirmed as completed and fitted with a Sunbeam Arab engine. Built by Angus Sanderson as part of an order for 250 aircraft which were mainly delivered to storage. Built by B & C as part of an order for 700 aircraft and fitted with a Rolls-Royce Falcon III. Built by B & C as part of an order for 500 aircraft of which only 468 were completed, fitted with a Rolls-Royce Falcon III engine. Built as part of an order for 215 aircraft. Built as part of an order for 84 aircraft. Designed in the second half of 1913 by Frank Barnwell and Harry Busteed, the first prototype of the Bristol Scout series was first flown on 23 February 1914 by co-designer Busteed, and was first seen in public at the March 1914 London Olympia exhibition centre's Aero Show event. It could have been said to have been somewhat "comical" in general appearance at that time in its original form, with characteristics such as a main landing gear wheel track measured at only 39 inches (99 cm) that was barely wider than the fuselage, only about a one half degree dihedral angle on the wing panels, making them look almost totally "flat" across from a nose-on view, and an engine cowl that had no open frontal area, even though the extreme bottom was sliced away horizontally to allow cooling air to get to its seven cylinder 80 hp Gnôme Lambda rotary engine, as well as a squared-planform "all-flying" rudder with no fixed vertical fin, which would become a hallmark (even though the shape was different) of Fokker-designed German fighter aircraft in World War I up through the Fokker D.VI.